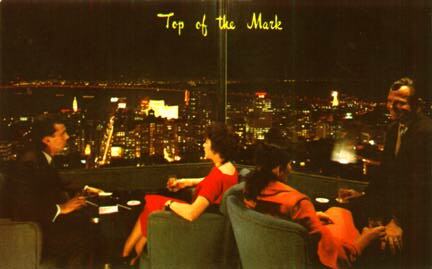 Vintage postcard, Top of the Mark. Detail In 1984, Partners in Crime was the first series that was filmed entirely in the City since The Streets of San Francisco. Shot on a sound stage on Custer Street in Hunters Point and at landmarks all over town, Partners in Crime was the story of two women who inherit a detective agency from a man to whom they were both once married. (The man proposed to both women at the Top of the Mark.) In the comedy-murder-mystery hour, Loni Anderson played Raymond Caulfield's ex-wife, Sydney Kovak, a street smart bass player who can crack safes and speak Chinese. Lynda Carter was Caulfield's first ex-wife, Carole Stanwyck, a broke society type and professional photographer. When Caulfield is murdered in the pilot, the women team up to solve the crime then continue as partners in Caulfield's detective agency. They also inherit his mansion at 2898 Vallejo Street, and their former mother-in-law, Jeanine, played by Eileen Heckart. Until she teams up with Carole, Sydney lives in the house at 2301 Scott Street in the heart of Pacific Heights. Not bad for a struggling bass player! Carson Productions spent $900,000 on each episode, making it one of the most expensive television series in 1984. In spite of its good production values, the seeming bankability of its two appealing leads, and its third star, San Francisco, Partners in Crime lasted only 13 episodes, including the pilot. Academy of Sciences: "Murder in the Museum"
Alamo Square: "The Hottest Guy in Town"
Bimbo's 365: "Is She or Isn't He?" de Young Museum: "Murder in the Museum"
Fort Point: "Murder in the Museum"
Ghirardelli Square: "The Hottest Guy in Town"
Hyde Street Pier: "The Hottest Guy in Town"
Mark Hopkins Hotel: "Celebrity," and "Fashioned for Murder"
Palace of the Legion of Honor: "Paddles Up"